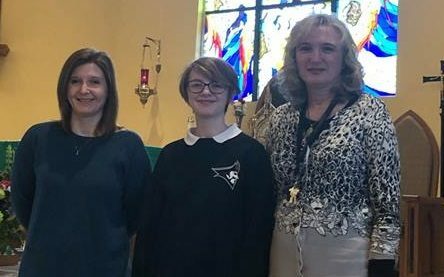 On January 22, 2019 Sacred Heart Catholic School in Danville, Virginia was notified that Seventh Grade student, Rhys Ana Savering had been named the Special Girls4Tech Recognition Winner for the National Tech4Innovation Student Contest. 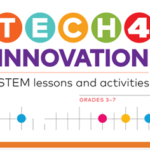 The Girls4Tech portion of the contest aims to recognize young ladies who show innovation and creativity in the STEAM (Science, Technology, Engineering, Arts, and Mathematics) field in an effort to encourage them to pursue STEAM related classes or careers. The Tech4Innovation Contest is a nationwide competition that is organized by Scholastic and is sponsored by MasterCard. Students from third to seventh grade can be entered in grade level division. Students are asked to create a concept that uses digital technology to solve real world problems in the context of a given category. Students must be able to draw the idea and describe what the innovation does and what problem it would solve. Rhys Ana will receive a new laptop and a cash prize for her winning entry. The school will also receive grant money to be used for enhancing student’s access to technology and encourage students to enter STEAM careers.